by Alan Caruba, Contributing Author: You know something is terribly wrong when three former Secretaries of State, Henry Kissinger, George Schultz and Madeleine Albright tell a Senate Armed Services Committee that the President of the United States is an idiot with no idea how to conduct foreign affairs. Well, they didn’t say it in those words, but that was pretty much the message. That was January 29. Two days earlier retired 4-Star General James Matthis, former head of U.S. Central Command, former Army Vice Chief of Staff and 4-Star General Jack Keane, and Navy Admiral William Fallon, also a former CentCom chief, had also testified before the Committee. They had a similar message as the diplomats. Obama and the other idiots in the White House are completely clueless regarding the threat of radical Islam in general and a potential nuclear Iran in particular. This is, after all, a White House that is trying to call those intent on taking over the entire Middle East and, after that, the rest of the world anything other than “terrorists.” They have used terms such as “insurgents”, “activists” and “militants.” Here at home, they are still referring to the killings at Fort Hood as “workplace violence.” Don’t any of these idiots understand that the terrorists, whether they call themselves al Qaeda or the Islamic State, Hezbollah, Hamas or any other name all constitute the same threat? That’s what the generals addressed. They told the Senate committee that absence of a White House strategy makes the ISIS, Iraq, Syria, Afghanistan wars “unwinnable.” I have been around since the end of World War II and that stretch of U.S. history is one in which we fought to a stalemate in Korea and a loss in Vietnam. After we won the conflicts in Afghanistan and Iraq, Obama pulled out and now they are lost too. There was a time when Americans and their leaders knew how to win wars. Indeed, there was a time when Americans preferred to elect generals to be their President, starting with George Washington. Among those with that rank were Andrew Jackson, Zachary Taylor, Franklin Pierce, Andrew Johnson, Ulysses S. Grant, Ruther P. Hayes, James A. Garfield. Chester A. Arthur. Benjamin Harrison, and Dwight D. Eisenhower. All the others had also served in the military in some capacity…except Barack Hussein Obama. Obama not only doesn’t have experience in the military, he doesn’t seem to like them much. He has done everything he can to reduce our military capacity to fight a war anywhere or to show any genuine respect for the troops on active duty. The only uniform he ever wore was as an Indonesian Boy Scout. Retired Marine Gen. Jim Mattis told the Congress “America needs a refresh national security strategy. We need to come out from our reactive crouch and take a firm, strategic stance in defense of our values.” Apparently those values don’t matter to the White House or to those left-wingers who wet their pants over the popularity of “Sniper”, a film that pays tribute to our troops who fought the war in Iraq. Under Obama’s term in office, radical Islam has increased four-fold in the past five years, ISIS ten times since 2012 and Iran has masterminded control of the capitols in Beirut, Lebanon, Damascus, Syria, Baghdad, Iraq, and now in Sanaa, Yemen. It has been the power behind Hezbollah in Lebanon and Hamas in Gaza. “Is there any doubt that Iran is on the march and is systematically moving toward their regional hegemonic objective?” asked Gen. Keane. “Iran has been on a 20-year journey to acquire nuclear weapons, simply because they know it guarantees preservation of the regime and makes them, along with their partners, the dominant power in the region, thereby capable of expanding their control and influence. Add to this their ballistic missile delivery system and Iran is not only a threat to the region, but to Europe, as well.” The U.S. in time will be in missile range. “We have no comprehensive strategy to stop it or defeat it,” said Gen. Keane. Thanks to Barack Obama, the United States of America can no longer be seen as the world leader, opposing the forces that seek to impose control. Former allies, particularly in the Middle East, no longer have any confidence that we would come to their defense if they were attacked. 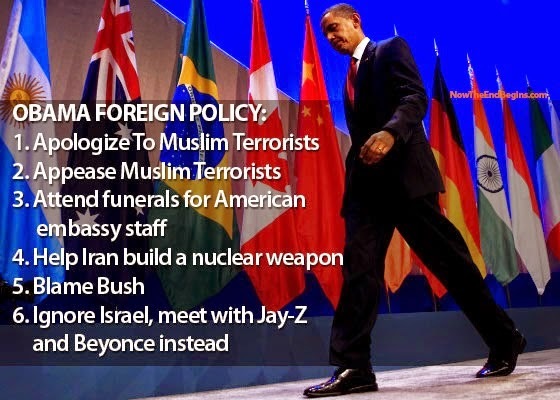 Thanks to Barack Obama, our enemies have been emboldened and our allies confused, but it is not that confusing. He is an idiot who lacks any grasp of history’s lessons and he is a coward who cannot be expected to seriously respond to our own and our allies’ enemies. Alan Caruba is a writer by profession; has authored several books, and writes a daily column, Warning Signs He is a contribution author on the ARRA News Service. Tags: Alan Caruba, Warning Signs, terrorist, our enemies, President Obama, policies, actions, To share or post to your site, click on "Post Link". Please mention / link to the ARRA News Service. and "Like" Facebook Page - Thanks!